Martinique was a base for French activity in the West Indies. 1 RWF was part of an expeditionary force sent to capture the island. It was highly commended for its contribution towards the defeat of the French. 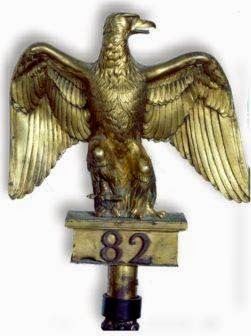 For its bravery the battalion was presented with the Napoleonic Eagle captured from one of the French regiments which surrendered. MARTINIQUE 1809 was awarded as a battle honour. Sir George Prévost with sword from Nova Scotia House of Assembly to commemorate his victory at Martinique, The Halifax Club, Halifax, Nova Scotia.